You never know what is going to trigger a market meltdown because they are not advertised in advance. The S&P futures started out positive on Monday evening at +3 but once Asian markets opened they quickly declined to -19. That is not a typo. The "cause" of the decline is reported to be strength in the dollar but the Dollar Index is only up 26 cents since Friday's close. When unexpected changes in direction appear, the talking heads on stock TV scramble to find something to blame for the event. Sometimes there is nothing to blame other than investors decided to take profits. 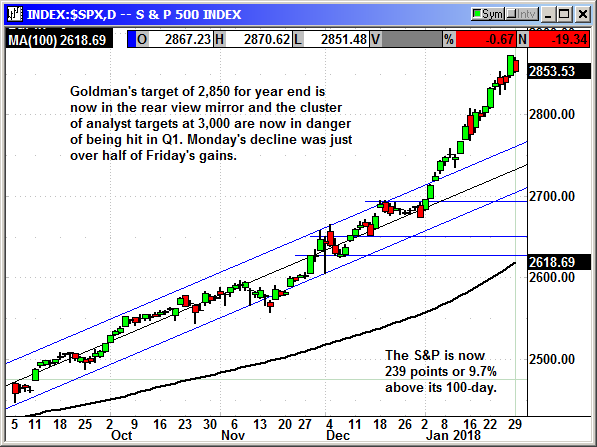 With the markets rocketing higher since January 2nd, there are plenty of profits at risk. Investors have stop losses on these positions and once a real decline appears, it becomes a race to the exits as those stops are hit, which causes further selling and more stops to be hit. The Asian markets are not down that bad. With this kind of decline, you would not expect the S&P to be imploding. 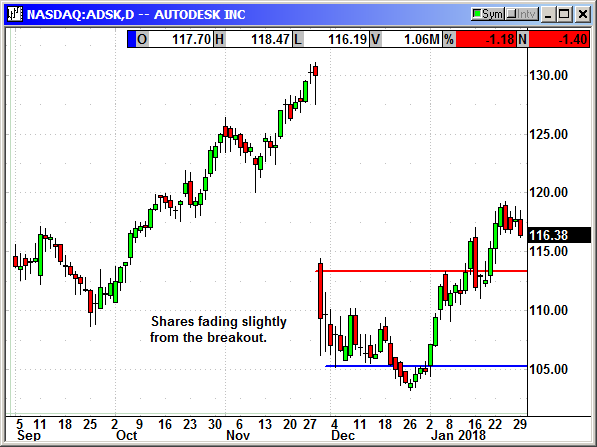 There is something else at play and it may be just time for a retracement. 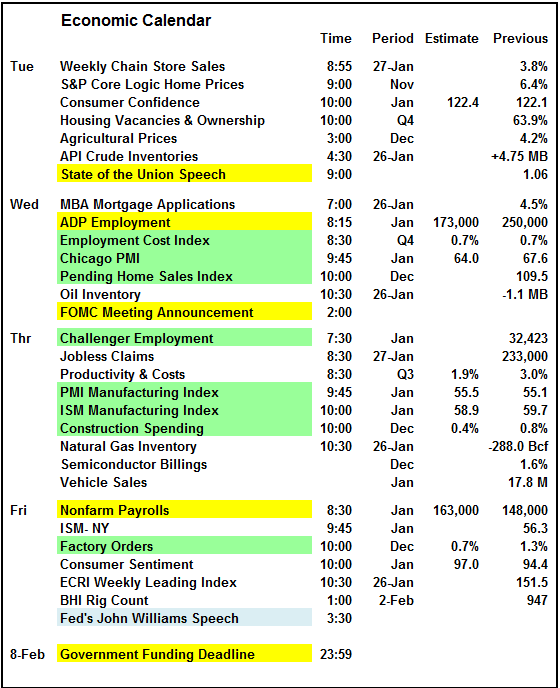 The calendar for the week is busy with jobs data, manufacturing data, State of the Union and FOMC meeting. The economic data is not likely to move the market. The data has been relatively benign for months with minor beats and misses. As long as that continues, and there is no reason to expect anything different, the market will ignore the data. The State of the Union speech on Tuesday could be a wild card. We never know what will be said and how it will impact the markets. Comments over trade wars, dollar weakness, treasuries, interest rates, tariffs, North Korea, Russian investigation, etc, could cause ripples in the market pond. The way the immigration fight is shaping up in Washington the odds are good we are going to get another government shutdown. Like we saw last week, the negative impact to the market was weak and the post shutdown rebound was strong. I would expect that same cycle if another shutdown appears. This will probably garner some comments in the SOTU speech. This is big cap tech earnings week and I was expecting the market direction to remain positive at least until the end of this week. 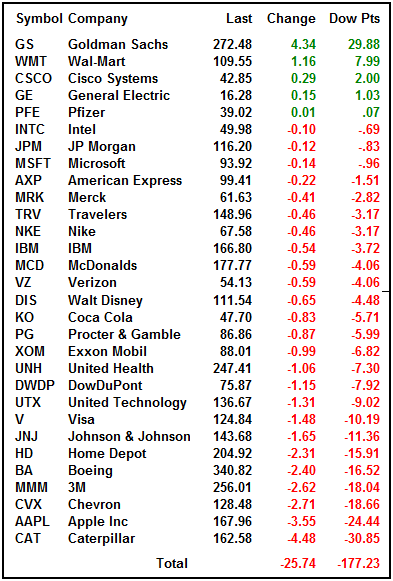 There are 125 S&P companies and 10 Dow components reporting. Most of the big tech will report including Microsoft, Apple, Amazon, Google, Alibaba, PayPal, Qualcomm, Facebook, etc. This week and next week are the busiest weeks in the Q4 earnings cycle. After today's decline the S&P is still 239 points or 9.7% above its 100-day average but that is not the big issue. As of Friday's close, the weekly RSI was at a record high. 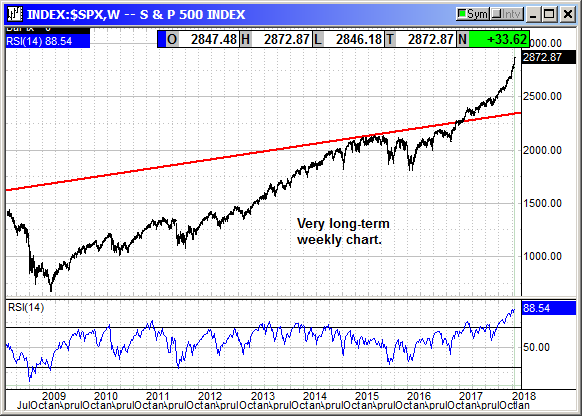 The weekly chart is off the charts in terms of vertical ramp. We are due for some profit taking in the coming weeks. Initial support is well back at 2,800 followed by 2,750. Bank of America warned of a 6% decline back to 2,686. 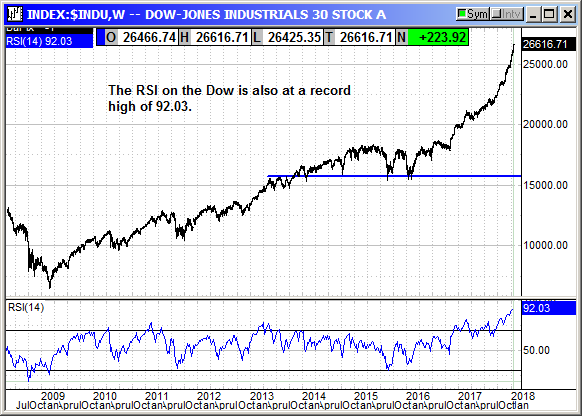 As of Friday's close the Dow RSI was also at a record high. A record means a 122-year high. Only the newest of investors would not understand that means the market is very overbought and in danger of a severe correction in the coming months. The Dow gave back -177 points today but that did not even retrace the gains from Friday. The initial support is back at 26,000 followed by 25,300. 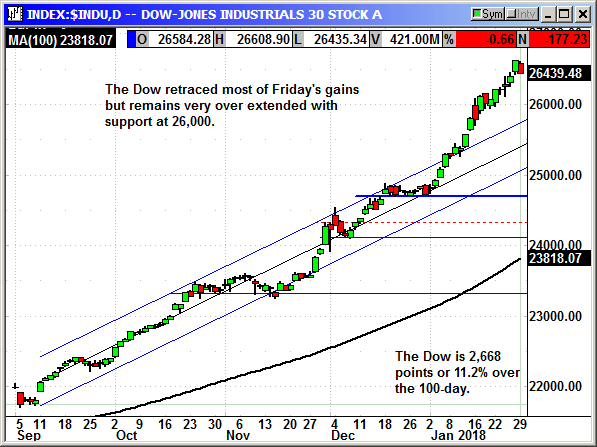 The Dow has accelerated so rapidly, there were very few pause points along the way to create support. 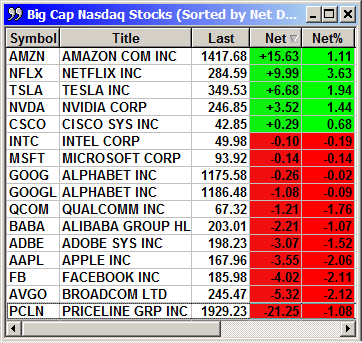 The Nasdaq only posted a minor decline but only five big cap tech stocks were positive. 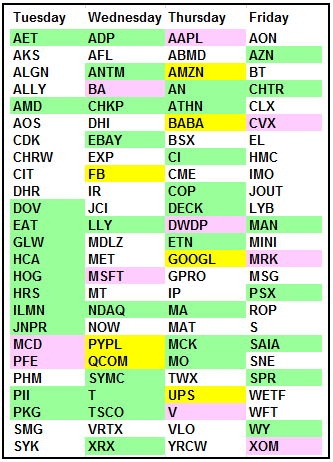 The rest posted minor declines with the exception of Priceline, which was offset by Amazon. 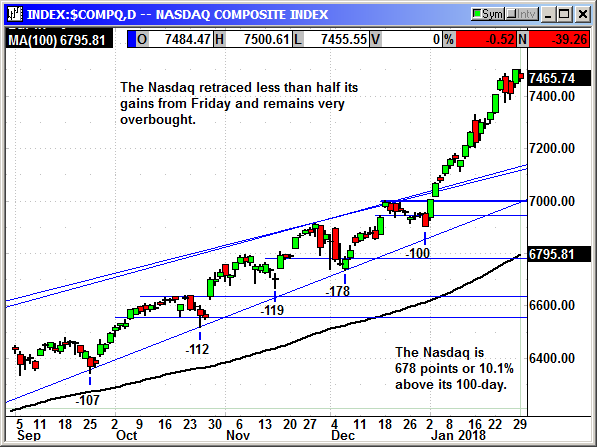 The Nasdaq is 10.1% above its 100-day average and very unsupported. The ramp from January 2nd has been nearly vertical and clearly out of character for the periodic declines over the prior six months. The index has light support at 7,400 followed by 7,220. That would be a long drop. The Russell chart has seen a steady progression of gains but nothing like the big cap indexes. This is what a normal chart looks like. 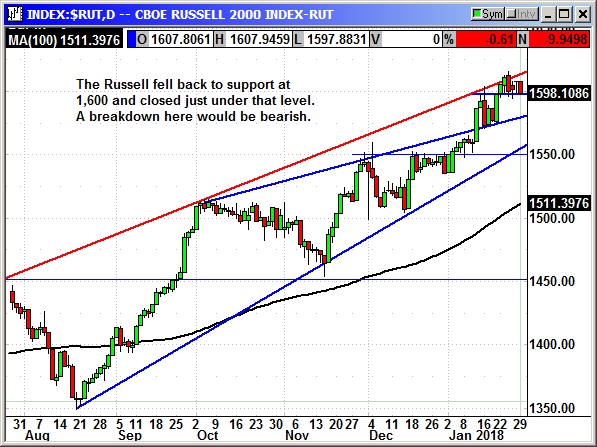 The index retreated to initial support at 1,600 on Monday with resistance at 1,610. A breakdown here could test uptrend support at 1,580 and then prior resistance at 1,550. I have been forecasting a rough patch for the market in early February because I thought the big cap tech earnings would keep investors in the market for the rest of this week. Once into next week the risk of another government shutdown looms large. This one could be longer and produce more headlines than the one we just endured. If the headlines become extreme, it could have a deeper impact on the market. Either way, i expect profit taking in February. Tighten up your stop losses and try not to jump right back into the market if we do get a decent decline. There will be plenty of opportunities in February to enter positions for the Q1 earnings cycle. Progress is not only fighting competitors but fighting off activist shareholders as well. The company has three involved but only one currently agitating for change. Praesidium Investment Management is the third largest shareholder (8.8%) and it opposes the company's attempt to turn itself into an artificial intelligence tools company. Praesidium has complained about their acquisition strategy to buy leading edge technology rather than spend years attempting to recreate it. The activist calls it venture capital type businesses. 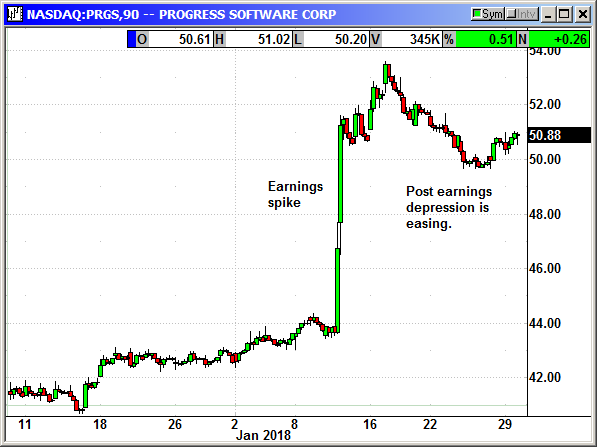 The Progress CEO defended their strategy saying "We are looking for mature businesses, companies that have been around for a while, and have grown to scale but growth may be slowing. By combining with these companies we can drive efficiencies and bring new products into the business. A Benchmark Company analyst said the company appears to be implementing bits and pieces of Praesidium's proposals in an effort to fend-off the activist hedge fund. Praesidium wanted seats on the board so in order to dilute the impact of those seats, Progress expanded the number of board positions. The company has been running "lean business" carefully managing costs and executing on their goals, according to the CEO. They reported earnings on January 10th of 67 cents that beat estimates for 61 cents. Revenue of $116.1 million beat estimates for $114.3 million. For the current quarter they guided for earnings of 46-48 cents on revenue of $90-$93 million. Analysts are expecting 38 cents. For the full year, they guided for $2.29-$2.35 and $398-$404 million. Activists mean the company has to pay a lot more attention to detail and always remain on their toes. This means they are more than likely going to continue executing with a minimum of wasted expenses. That means higher profits. Shares spiked about $8 on their earnings and have pulled back only slightly over the last three weeks. They are holding just over the $50 level and posted a gain today when the Nasdaq was negative. Buy June $55 call, currently $2.55, initial stop loss $47.85. The long call position was closed at the open on Thursday. The long call position was closed at the open on Tuesday. Sellers remorse!! We closed the ABBV position at the open on Thursday ahead of earnings on Friday. It was a decent gain of about $800. 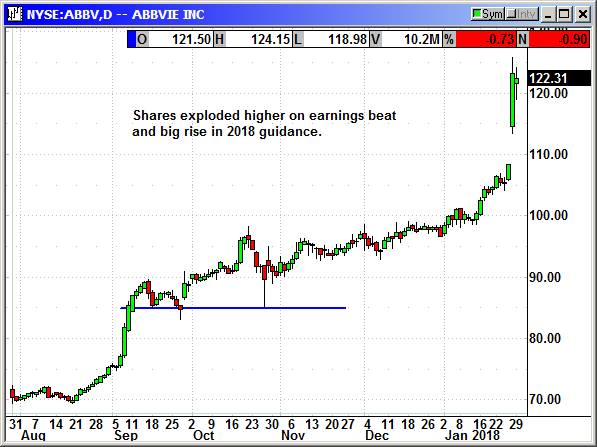 Unfortunately, ABBV posted blowout results and guidance and the stock rallied $20 on Friday. We cannot cry over spilled milk or missed profits in this case. They could just as easily have reported disappointing earnings and fallen $20 on Friday. Closed 1/25: Long Feb $95 call @ $3.75, exit $11.70, +$7.95 gain. No specific news. Shares faded slightly from the 2-month high. 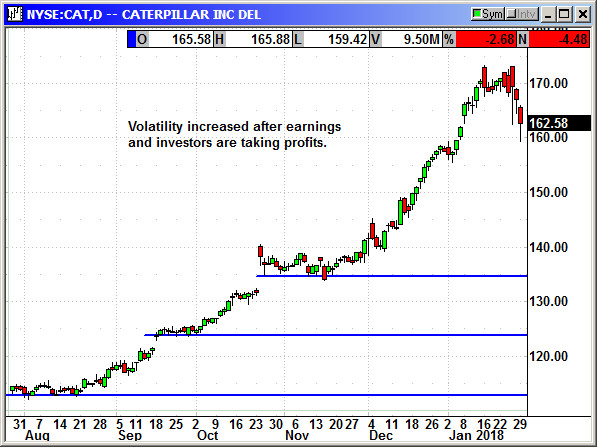 We exited the CAT position on Tuesday before their earnings. 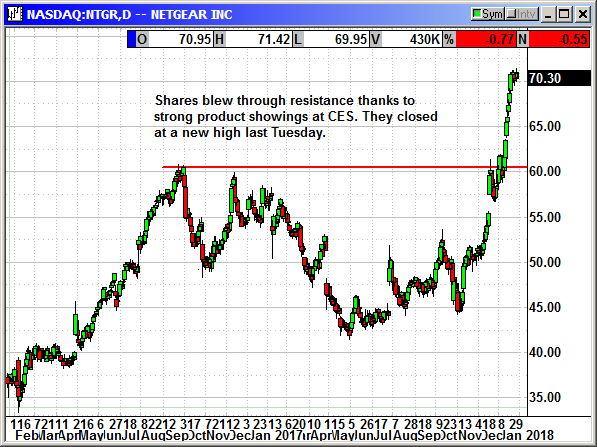 They had great earnings and shares double topped at $173 before crashing back below $160 three days later. This is an example of why we do exit before earnings. Anything can happen and it is normally in our best interest to take profits off the table in advance. A dollar in hand today is better than the potential for none in hand tomorrow. 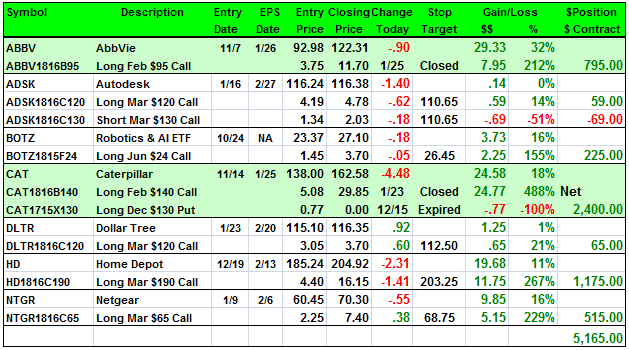 Closed 1//23: Long Feb $140 call @ $5.08, exit $29.85, +$24.77 gain. No specific news. 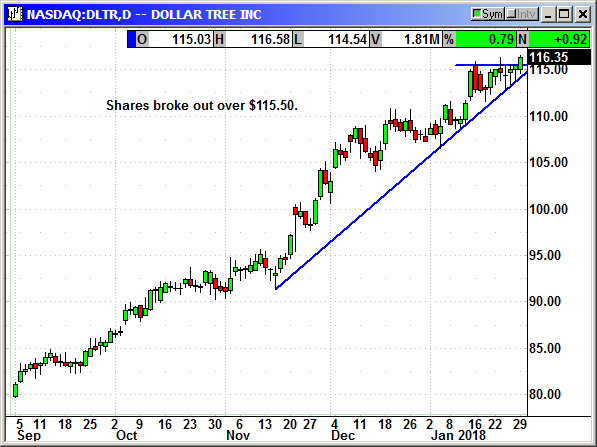 This position is going according to plan with the stock punching through the resistance highs at $115.50 on Monday in a weak market. If the market were to cooperate we could see DLTR accelerate higher. 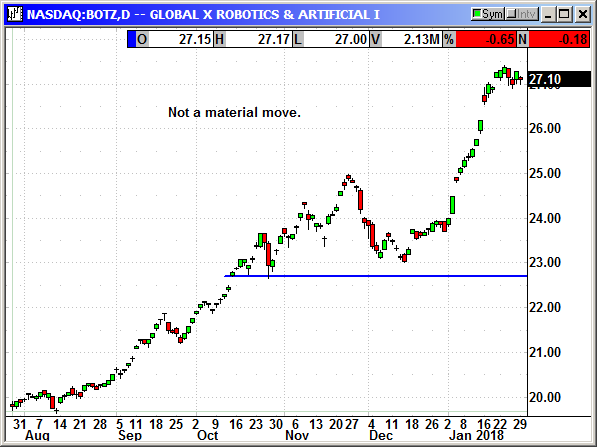 Long March $120 call @ $3.05, see portfolio graphic for stop loss. No specific news. 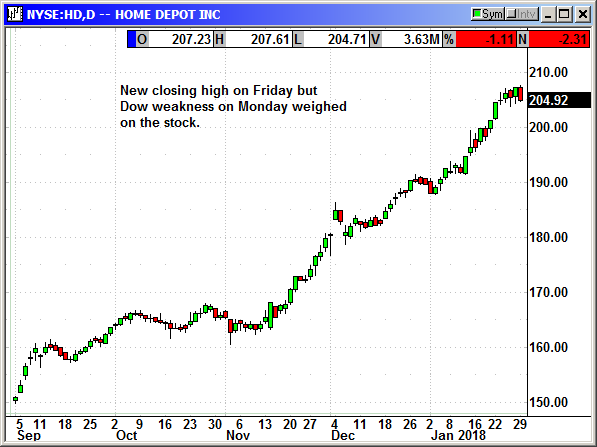 HD shares closed at a new high on Friday but Dow weakness on Monday weighed on the stock. HD is now one of more than 100 companies giving employee bonuses because of the tax reform package. They are giving their hourly workers up to $1,000 each as a bonus. The bonus is based on length of employment starting at $200 for 2 years of service. No specific news. Shares have stalled at $71 after the CES headlines faded.